What and incredible weekend of racing in Australia, and for Australia's leading stud Arrowfield! Saturday 14 October 2017 is a date that followers of the fortunes of the Redoute's Choice dynasty and in particular, his spectacular sons Snitzel and Not A Single Doubt, will remember for a long, long time. By the end of it, Snitzel had cracked $10 million on the Australian General Sires' premiership and Not A Single Doubt's four new stakeswinners, emulating Snitzel's feat on 13 May 2017, and including his 8th Group 1 winner, had taken him to second spot with $3.5 million. Caulfield, 12.20 pm - Sheikh Hamdan's 2YO filly Qafila (Not A Single Doubt-Zighy Bay by Tapit) pounced late to claim the $120,000 MRC Inglis Debutant S. 1000m LR. from Sacred Sword and Encryption. Watch Qafila win the MRC Inglis Debutant S. LR. She's trained by the Hayes & Dabernig team that turned out Snitzel's 2YO daughter Nomathaj to win last Saturday's VRC Maibyrong Trial S LR, carrying the same, famous blue and white silks. Qafila is Woodpark Stud's first stakeswinner as a breeder and was purchased from Attunga Stud at the Magic Millions Sale for $450,000, making her Not A Single Doubt's second top-priced yearling filly this year. Qafila is now his 17th juvenile stakeswinner. The Gerald Ryan-trained colt Legend Of Condor (ex Rhodamine by Success Express), gritty debut winner of the $100,000 Victory Vein Plate at Randwick 20 minutes after Qafila's win, may well be Number 18. Royal Randwick, 1.15 pm - 3YO filly Torvill (Not A Single Doubt-Bolero Queen by Iglesia) put up the best performance of her eight-start career to land the $125,000 ATC Reginald Allen Quality 1400m LR, with Yulong Xingsheng and Workdrinks filling the placings. Torvill's winning time of 1:22 flat was a new race record and trainer Clarry Conners indicated a race in Melbourne is now a possibility for her. Watch Torvill win the ATC Reginald Allen Quality LR. From the family of Queensland Derby G1 winner Ruthven and multiple Group winner Cangronde, Torvill is raced by her breeders Barry Garforth and Max Kowalczuk. Caulfield, 1.30 pm - Former Western Australian mare Cool Passion (Not A Single Doubt-Hiavanna by Mister C) made Guineas Day memorable for her owners John & Anne McDonnell, Jane Henning & Mr D. Balian when she defeated Pedrena and Princess Of Queens in the $150,000 MRC Northwood Plume S. 1400m G3. Watch Cool Passion win the MRC Northwood Plume S. G3. Bred by Michael MacDermott, Cool Passion was having her first start in Melbourne for trainer Tony McEvoy after eight wins in the West. 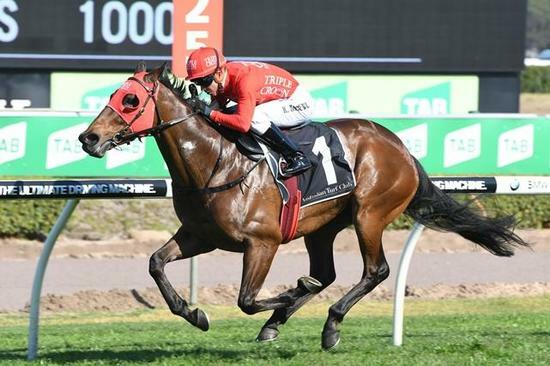 Royal Randwick, 4.15 pm - the inaugural running of the world's richest turf race, the $10 million The Everest over 1200 metres ended with a perfect performance by Snitzel's powerhouse son Redzel. The 5YO gelding jumped smartly, slotted in just behind the early leader Houtzen, took control soon after the turn and sprinted clear to score by almost a length from Vega Magic, Brave Smash and Chautauqua. Emotions over-flowed around the Randwick winner's circle as trainers Peter & Paul Snowden, jockey Kerrin McEvoy, slot-holder James Harron and the ecstatic group of owners managed by Triple Crown Syndications' Chris & Michael Ward began celebrations likely to last several days. Watch Redzel win The Everest. Bred by Lee Fleming from the Rubtion mare Millrich, Redzel was a $120,000 purchase by Triple Crown from the Marquee Stud draft at the 2014 Magic Millions Sale. He has now won ten of his 20 starts, including last season's Doomben 10,000 G1, and $7.1 million. Caulfield, 4.30 pm - an unexpected victory in the $2 million MRC Caulfield Guineas 1600m G1 by 100/1 shot Mighty Boss (Not A Single Doubt-Bullion Mansion by Encosta de Lago) completed an unforgettable day. Watch Mighty Boss win the MRC Caulfield Guineas G1. Mighty Boss gave co-owner Muzaffar Yaseen of Teeley Assets his second Caulfield Guineas win, 18 years after Redoute's Choice won a magnificent battle with Testa Rossa for the 1999 race. Bullion Mansion was bought by Coolmore for $160,000 in foal to Not A Single Doubt from the 2014 Teeley Dispersal at the Magic Millions National Sale. The resulting colt was offered by Curraghmore Stud at the 2016 NZ Premier Sale where he was bought for $180,000 by trainer Mick Price, who shares the colt's ownership with Teeley Assets. Four hours and 10 minutes, a Group 1 Classic victory, three other Group & Listed stakes wins, one Everest and more than $7.2 million prizemoney - truly an amazing day at the office for the superstar sons of Redoute's Choice. Caulfield Photos by Bronwen Healy; Royal Randwick Photos by Sportpix.